A wide and even 120 degree beam angle provides consistent lighting with no hot spots or edge rings. Waterproof to 60 meters/180 feet, the kit includes a bracket with standard tripod mount and GoPro adapter. 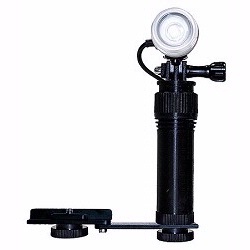 The rechargeable 18650 battery delivers 640 lumens of light with a burn time of over 2 hours. Low Power setting doubles the burn time. A CREE XM-L2 LED with 100,000 hour lifetime is controlled by Intova thermal protection circuitry with auto dim. The rugged polycarbonate battery casing doubles as a hand grip for ease of use and panning control. 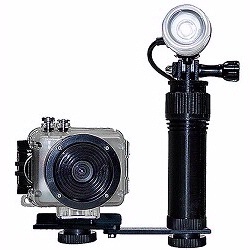 Included accessories: camera bracket, 18650 Li-ion rechargeable battery and battery charger. Operation Modes Long press the power switch for ON/OFF 1) Full Power, 2) Med Power, 3) Low Power. Quick press 2 times for 4) Fast Strobe Mode, 5) Slow Strobe Mode, 6) SOS Mode. Light defaults to last power setting when turned on again. *Lightly lubricate O-rings with silicone grease prior to use and maintain lubrication at all times.